However, the formulation of tough, monolithic, flexible coatings such as polyurea are now resolving this issue for contractors, engineers, and facility managers. When applied directly to concrete or metal surfaces, polyurea not only reinforces and protects the underlying substrate but can also bridge gaps or cracks of 1/8" or larger. Furthermore, polyurea is now being pre-applied to geotextile liners that can be quickly rolled out in sheets to protect more heavily damaged surfaces or for use in field applications such as dirt or gravel pads at drilling sites. Once installed, applicators need only coat the seams of the liners to create a monolithic surface that is ideal for containment. Whether at refineries, industrial plants, or other manufacturing facilities, federal and state regulations mandate the use of primary and secondary containment systems to keep toxic or hazardous substances from escaping into the ground and potentially entering the water supply. Implied in this requirement is the understanding that primary containment (typically via a concrete or metal storage vessel that holds chemicals or liquids) is not foolproof. Though durable, metals corrode, concrete cracks and is porous as well, so will leach liquids if uncoated. This requires secondary containment, which often takes the form of concrete pits with barriers installed around the perimeter of a tank or other storage container. To protect these structures, coatings such as epoxies, tars, and polyurethanes are often applied as an added barrier of protection. However, these traditional coatings are frequently inflexible when cured and can crack along with the concrete. "Typical coatings do not hold up well to substrate movement or daily, seasonal, or process-related thermal expansion and contraction, which can lead to cracks and leaks," says Jim Collins, co-owner of South Penn Resources, a company that creates containment systems in the Pennsylvania region. After considerable research and testing, Collins says he turned to an advanced polyurea system from VersaFlex, a manufacturer of spray applied polyurea for primary and secondary containment. "Polyurea can bridge cracks as well as flex at a rate similar to concrete and steel," says Collins. "This not only helps it last but also seals the concrete so it does not absorb contaminants if there is a spill inside the contained area." While traditional coatings such as cementitious, epoxies, tars, and polyurethanes will prematurely fail if not installed under a relatively narrow range of temperatures, polyurea is designed for installation and use from -40°F to +350°F. It sets and cures quickly and will withstand decades of freeze-thaw cycling, as well as wide variations of temperature and humidity. "After spraying the polyurea, return to service is almost instantaneous, which can make a big difference in minimizing production downtime," says Collins. "We coated about 8,000 sq. ft. of concrete in 12 truck-offloading areas that required drive-in containment with VersaFlex polyurea. Within minutes of spray application, trucks were safely driving across it." Although spraying polyurea directly to the substrate has many advantages, for containment over soil, gravel, or even concrete that is too damaged to be effectively rehabilitated, pre-sprayed composite panels offer superior protection. This solution is particularly suited to field applications that must be able to endure heavy traffic from trucks loading or unloading materials. Although plastic liners that are seam-welded together are often used for such applications, they are more easily punctured and can bunch up under heavy use. "For primary containment at oil field drilling sites, we used to put various plastic systems on the well pads, but we moved away from that because plastic was not durable enough," says Collins. Repairing plastic liners also presents a problem at the seams, when damaged areas are cut out and new sections welded in, says Collins. "The result is a patchwork liner with seams that are prone to failure due to improper welding as well," he says. As a solution, Collins turned to geotextiles with pre-applied polyurea for its significant advantages in durability and reusability. "Polyurea products are so much more durable than plastics for containment systems," says Collins. "When needed, we can custom apply more polyurea millage to geotextile panels and berms to accommodate even the heaviest truck use and vehicle abuse." To verify the strength of the polyurea coating on containment mats and berms, in fact, Collins conducted a number of tests. "I ran an 11,000 pound skid loader onto a containment mat, stood the forks straight up and tried to puncture it - but it did not puncture through," says Collins, who put the test video on South Penn Resources' website. "We also ran 6,044 fully loaded water trucks across a containment system and it withstood it with zero holes and no compromise to the liner." Collins credits both the durability of the VersaFlex polyurea as well as its extended recoating window for the ability of his company to extensively reuse its containment systems. "To reuse a containment system, we'll cut it up into rolls, roll it up and move it. Then we'll take it back out, respray certain areas, and reinstall the original containment system at another location," explains Collins. 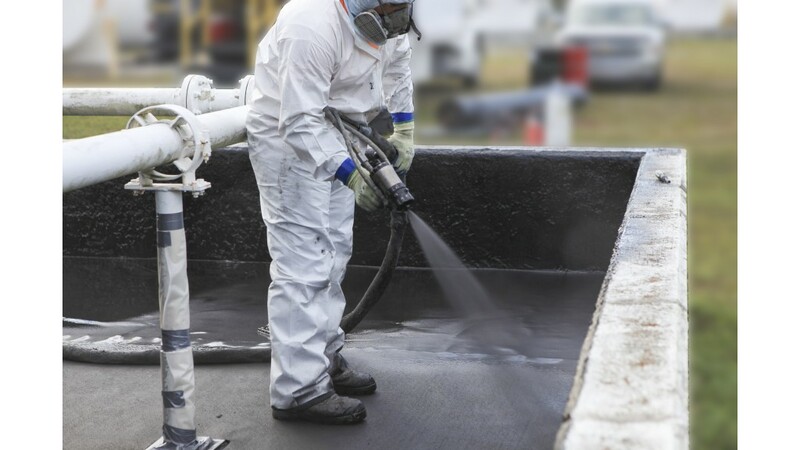 To create the most durable, seamless, and reusable containment mats and berms, Collins sought to determine the best polyurea for the application. "Some polyureas look fine the first time you spray it, but the preparation needed to get any seams to bond for reuse can be challenging," says Collins. "However, we've found the extended open window for recoat and repair of the VF380 polyurea allows us to easily cut out any damaged section of geotextile, put a new piece in, and spray the seams to make it virtually seamless again. We get better repair and more reuse out of our containment systems."